Ossbrowser is a graphical management tool developed by Alibaba Cloud. It provides features similar to those of Windows Explorer. 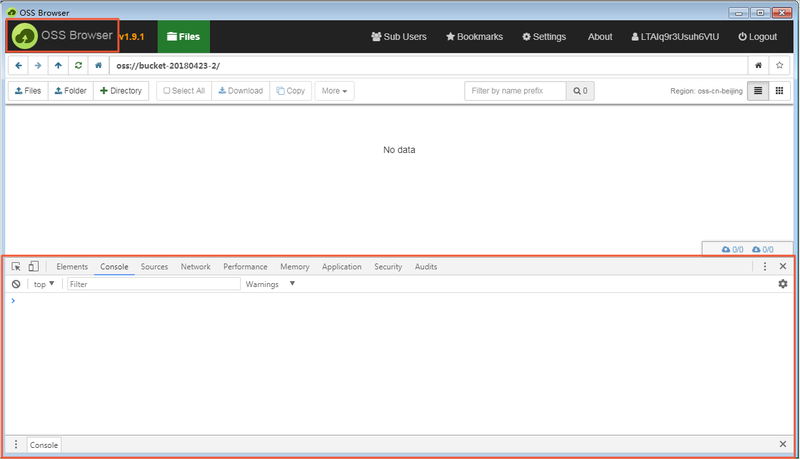 Using ossbrowser, you can view, upload, download, and manage objects with ease. You can only move or copy objects smaller than 5 GB by using ossbrowser. For objects larger than 5 GB, we recommend you use ossutil. Ossbrowser supports Linux, Mac, and Windows (Windows 7 and later). We recommend you do not use ossbrowser in Windows XP and Windows Server. Note For more download URLs, see GitHub. Endpoint: Select the region (endpoint) that you want to log on. Default: Log on to ossbrowser with the default endpoint. Customize: Enter the endpoint you want to use to log on to ossbrowser. 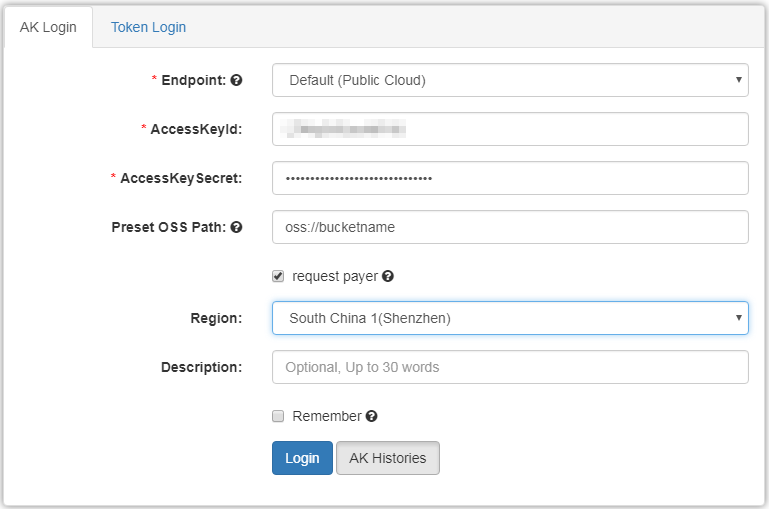 You can enter a URL starting with "http" or "https" to log on to ossbrowser through the HTTP or HTTPS method, for example, https://oss-cn-beijing.aliyuncs.com。For more information about the regions and endpoints, see Regions and endpoints. cname: You can log on to ossbrowser with a custom domain name (CNAME) attached to your OSS resources. For more information about attaching a CNAME, see Attach a custom domain name. AccessKeyId/AccessKeySecret：Enter the Accesskey (AK) of your account. To ensure data security, we recommend that you use the AK of a RAM user to log on to ossbrowser. For more information about AK, see Create an AccessKey. Administrator RAM users with administration permissions on all buckets: No configuration is required. Operator RAM users: Configurations are required. Enter the path of the OSS bucket or sub-directory that you want to access (the RAM user must have permission to access the OSS bucket or sub-directory). The path format is as follows: oss:// bucket name/sub-directory name/. Region: Select the region where the OSS resources belong to. Remember: Select to save the AK. When you log on to ossbrowser later, you can simply click AK Histories and select the saved AK instead of entering the AK repeatedly. Do not select this option if you use a shared computer. Ossbrowser supports simple management operations on OSS resources. On the main interface of ossbrowser, click Create Bucket. Name: The name of a bucket can be 63 characters in maximum and must be unique. Region: Select the region where the bucket belongs to. ACL: Select the ACL for the bucket. For more information about ACL, see ACL. Type: Select the default storage class of the bucket. For more information about storage class, see Introduction to storage classes. Select the bucket that you want to delete, and then click More > Remove. Note A bucket cannot be deleted when objects or parts are stored in it. On the main interface of ossbrowser, click the bucket in which you want to create a folder. Enter the name of the directory and click OK.
Emoticons are not allowed in a directory name. Use compliant UTF-8 characters in directory names. You can create only a single-level directory at a time. For example, you can create a single-level directory abc but not a multi-level directory abc/123. A sub-directory named .. is not allowed. The length of a directory name must be in a range of 1 to 254 characters. In the specified bucket or directory, click Files/ Folder, and then select the files or folders that you want to upload. Note You can upload multiple files or folders at the same time. In the specified bucket or directory, select the objects or directories that you want to download, and then click Download. Note You can download multiple objects or folders at the same time. In the specified bucket or directory, select the objects or directories that you want to copy, and then click Copy. Enter the bucket or directory where you want to copy the data to, and then click Paste. Notice If the source address and target address of the copied object are the same, the original object is overwritten. If the storage class of the overwritten object is IA or Archive and the storage period of the object does not reach the required value, fees incur for the advanced deletion. For more information, see Billing items. In the specified bucket or directory, select the objects or directories that you want to move, and then click More > Move. Enter the bucket or directory where you want to move the data to, click Paste. Notice When you move an object or a directory, the object or directory is copied from the source address to the target address, and the object or directory in the source address is deleted. If you move an object of the IA or Archive storage class and the storage period of the object does not reach the required value, fees incur for the advanced deletion. In the specified bucket or directory, select the objects or directories that you want to rename, click More > Rename, and then enter the new name. You can only rename objects smaller than 1 GB. When you rename an object or a directory, the object or directory is copied, renamed, and then saved. The original object or directory is deleted. If you rename an object of the IA or Archive storage class and the storage period of the object does not reach the required value, fees incur for the advanced deletion. Select the object or directory that you want to delete, and then click More > Remove. Notice If you delete an object of the IA or Archive storage class and the storage period of the object does not reach the required value, fees incur for the advanced deletion. Generate an access URL for an object. Select the specified object, and then click More > Address. Enter the valid period of the URL, and then click Generate. Click Copy or Mail it to send the URL to users who want to access the object. You can also scan the QR code to access the object. You can double-click an object to preview it. You can preview images and objects in the txt and pdf formats in ossbrowser. Select the specified bucket, and then click Multipart. You can delete unnecessary parts. You can click Settings to configure the following parameters. Upload tasks concurrent number: Specify the maximum number of upload tasks that can be performed at the same time. If the number of upload tasks is larger than the value, the additional tasks are scheduled into a queue and wait for the current tasks to be complete. Setting this parameter properly based on your bandwidth can improve the upload speed. Download tasks concurrent number: Specify the maximum number of download tasks that can be performed at the same time. If the number of download tasks is larger than the value, the additional tasks are scheduled into a queue and wait for the current tasks to be complete. Setting this parameter properly based on your bandwidth can improve the upload speed. overtime: Specify the timeout period for tasks. uploadpart size: Specify the part size in multipart upload tasks. When the file to be uploaded is too large or the network condition is poor, you can set an appropriate part size to upload the object in multiple parts. retry times: Specify the allowed retry times in upload or download tasks. You can click Settings to set your E-mail account. All operations related to mails in ossbrowser are performed by the account. 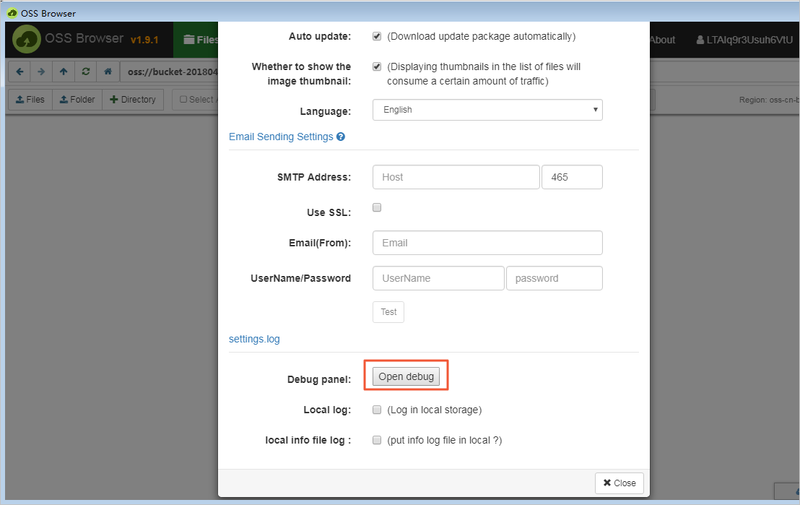 You can enable the debug mode in the following two methods to view the logs generated by upload, download, and other operations. Method 1: Click Settings, and then click Open debug. Method 2: Continually click the OSS Browser logo at the upper left corner for 10 times. You can select whether to enable the logging function in the Settings dialog box. Select local info file log to collect normal local file information.